Clean and plentiful drinking water. Environmentally safe and responsive measures for collecting and treating wastewater and reusing wastewater by products. Collection and operation of a recycling facility open to the public. Maintenance of transportation facilities that efficiently and safely accommodate multiple modes of travel. Maintenance of park and recreation facilities. The City of Medical Lake’s goal is to provide safe and dependable supply of drinking water. The City’s water is drawn from four wells. Our water is drawn from two aquifers, the Wanapum and the Grande Ronde. We routinely monitor for constituents in the drinking water according to Federal and State laws. 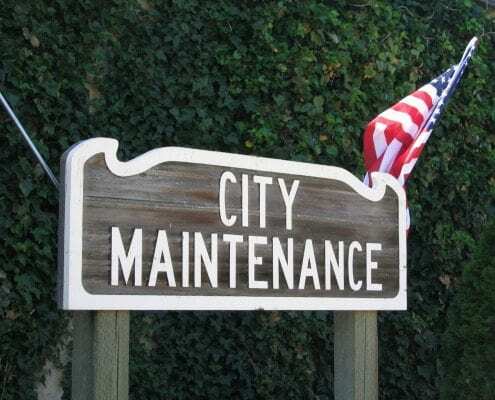 The City of Medical Lake continues its commitment towards providing the best streets, sidewalks and storm drains for the citizens of this community. Along with annual pothole patching, street sweeping, noxious weed control and other routine street maintenance, the City has begun a crack sealing program it hopes to continue for many years. Call before you dig: Planning a remodel, planting a tree, putting in a fence or any other construction? Be sure to call for a utility locate before you dig. The One Call # is 1-800-424-5555. 0 – 20,000 Gallons $ 1.10 per 1,000 Gal. 20,001 – 30,000 Gallons $ 1.20 per 1,000 Gal. 30,001 – 40,000 Gallons $ 1.30 per 1,000 Gal. 40,001 Gallons – and over $ 1.50 per 1,000 Gal. For information on commercial or multiple unit services please contact our office at (509)565-5000. Signing up for a new utility account? You will need to bring your driver’s license. If you’re renting you’ll need your driver’s license and rental/lease agreement. You will need information from your current utility bill to pay online. Fairchild Air Force Base has concluded their testing for PFOS and PFOA at the City’s Craig Rd. Well. The tests came back as “non-detect”, meaning PFOS and PFOA are not present in the well at this time. Garbage day is Wednesday. Please place your garbage cans on the curb in front of your home the night before. Garbage will be a day late if the following holidays fall on the working days prior to your garbage day. When in doubt please put the garbage out. We would gladly answer any of your questions. Call Monday through Friday, 8:00am to 4:00pm at (509) 299-7715. 8:00 A.M.. to 4:00 P.M.